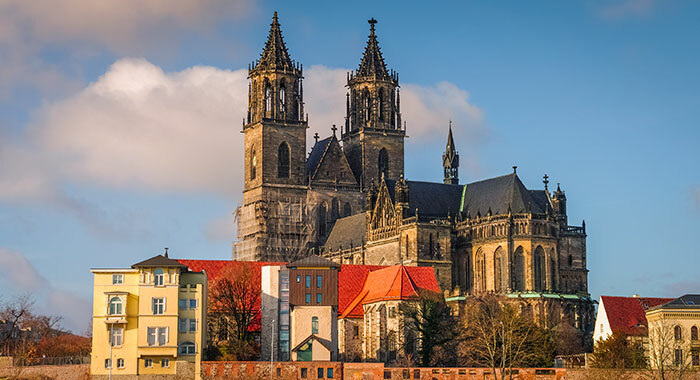 Magdeburg Cathedral in eastern Germany. When I tell you I’ve been on a quest, I’m referring to a real-life journey: a pilgrimage of sorts, albeit in the guise of a study tour. And, like any pilgrim, I was hoping for some special moment at my destination: if not a personal boon, at least some shiver of recognition. More than hoping, actually: I was definitely expecting a small epiphany and, what’s more, I was pretty sure I knew where it would come. Our seminar group from St. Norbert College would be stopping at the tomb of our eponymous saint – and, although many schools are named after saints, it’s not every institution that can, so to speak, give its people the chance to visit those saints in person. I suppose my mind had been running on relics, and for this I blame three folk: a priest-sculptor of our abbey; Mother Teresa’s photojournalist; and our college president. I only encountered Father Don Noel once, and he had just returned from a pilgrimage himself. Noel was undertaking a forensic reconstruction of the head of St. Norbert of Xanten – an endeavor that yielded the best likeness we have of this 12th-century reformer. In Prague, Noel had cradled the skull of Norbert in the hands I was now clasping. A touch of bone – even a touch at one remove – gets your attention: It has an impact quite different from that of an overly familiar name. A few weeks later, I happened to be introduced to the photographer who had lived with, and documented the work of, the Blessed Mother of Calcutta. That’s a story for another day but, all the same … . Let nobody suppose that our fervor for relics ended with the Middle Ages. So this notion of hanging with the saints, if by degrees of separation, was not a new one to me when our president mentioned he had visited, on the eve of his inauguration, the tomb of Abbot Bernard Pennings. Pennings, who lies in the crypt of our abbey, was our college’s founder and first president – president through the better part of the ensuing six decades, in fact. “I thought it might be a good idea to spend some time with the old guy,” said Tom, simply. I was struck by the common sense, not to mention the courtesy, of this gesture. And actually, I wouldn’t be surprised if he’s been back there a few times since. We have reclaimed our heritage and our group – the seventh annual Cornerstones seminar – was one of the outcomes. We were preparing to tour eight Norbertine abbeys; we were bound for Prague where I, for one, was intent on spending some time at the tomb of Norbert himself. St. Norbert is big in Prague – literally. His is the central statue on the much-visited Charles Bridge – bigger even than his stony neighbor, Wenceslas. In fact, Norbert is a key figure in church history, as well as the patron saint of Bohemia. Before all that, he was the younger son of a noble family, finding his position in life as a desultory cleric. After his conversion, he was to become itinerant preacher, peacemaker, radical reformer of the Church and founder of the religious order that bears his name. In 1627, Norbert’s earthly remains were brought from Magdeburg, the site of his archbishopric, and entombed in Strahov Abbey, high above Prague. Strahov is pretty much the first thing tourists hit when dropped at the gate of the old city. The abbey is beset with visiting groups; ours was behind schedule; we arrived at the chapel of St. Norbert in a rush and a pother. There was no time for a Mass at the tomb; no time for a quiet moment alone with the old guy. No time for more than a brief common prayer, a photo op, a backwards glance as we headed on to the (magnificent) abbey library. No, my moment did not come in Prague. It came, as moments should, quietly and after I had quite forgotten to look for it. We had quit Catholic Europe and, were, in fact, in a Lutheran cathedral in the former East Germany. As our church historian reminded me, “it’s essentially Protestant from here to the North Pole” and, moreover, the Communist era had bequeathed a determinedly secular society. But this was Norbert’s own cathedral of Magdeburg – or, rather, the Gothic cathedral begun in 1209 over the ruins of his. Here it was the job of the Domführer – our cathedral guide – to deftly manage for us the varying claims and distressing prejudices of Jews and Christians; Protestants and Catholics; Nazis, Communists and their opponents. This she was to accomplish with beautiful tact and remarkably good English – the latter and, who knows, possibly the former also, perfected at the University of Dundee. And we, the first group from the college ever to visit the cathedral, were led straight to its most cherished artifact, the porphyry font recovered from Norbert’s original church.